Stationary bicycles come in two varieties: upright and recumbent. Upright bikes simulate a regular bike, only you don’t go anywhere. Recumbent bikes have bucket seats so you pedal out in front of you. Neither type is superior; it’s a matter of preference. Bikes are great for toning your thighs (and recumbents are especially good for your behind), and they give your knees a break while offering a terrific aerobic workout. Bikes also suit anyone who wants to read while working out. The recumbent offers more back support and may be more comfortable for people with lower-back pain. If you’re new to exercise or heavyset, you may also find a recumbent bike more comfortable. Adjust the seat. When the pedal is at the lowest position, your leg should be almost, but not quite, straight. You shouldn’t have to strain or rock your hips to pedal. Your knees shouldn’t feel crunched when they’re at the top of the pedal stroke. 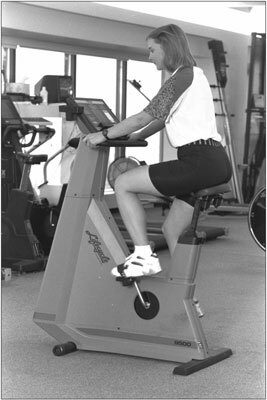 With a recumbent bike, you adjust the seat forward and back, rather than up and down, but the principles are the same. Set the handlebars correctly (if your bike allows adjustments). You should be able to hold the bar so that your arms extend out at shoulder level. You shouldn’t have to squirm around to get comfortable. Handlebar adjustment is especially important if you’re very tall or very short. Get to know the display panel. For instance, notice how many levels the bike has. Some bikes feature 12 levels; others have 40. So if you just hop on and press Level 6, you’ll get two very different workouts. Also, pay attention to your cadence — that is, how many revolutions per minute (rpm) you’re cycling. Varying your cadence is a good idea. You may want to hum along at 80 rpm for 5 minutes and then do 30-second intervals at 100 rpm using the same tension level. Adjust the pedal straps so that your feet feel snug — but don’t let the straps cut off your circulation. Riding a bike with the foot straps is much more comfortable and efficient than pedaling without them. Don’t remove the pedal straps from your bike; this forces the next person to waste time putting them back on. Don’t pedal with just your toes. Otherwise you may bring on foot and calf cramps. Instead, press from the ball of your foot and through your heel as you pump downward on the pedal, and pull up with the top of your foot on the upstroke. Don’t hunch over. Rounding your back is the way to develop back and neck pain. Don’t get your upper body into the effort, either. Instead, keep your chest up, shoulders back and down, ears in line with your shoulders, and belly button drawn in. Unlike some other machines, riding a stationary bike is not a total-body workout; don’t try to make it one. If you have to rock wildly from side to side, grit your teeth, or clench the handlebars, you need to lighten your load.